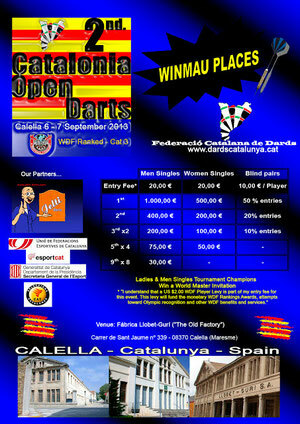 Clica el cartel y tendras toda la información del 2 Catalonia Open Darts. Enlace Federaccio Catalana de Dards. I have been surfing online more than three hours today, yet I never discovered any fascinating article like yours. It is lovely worth sufficient for me. In my view, if all webmasters and bloggers made good content as you probably did, the net will probably be a lot more useful than ever before. I got this web page from my friend who informed me on the topic of this website and at the moment this time I am browsing this web site and reading very informative content at this time. Good post. I learn something new and challenging on websites I stumbleupon every day. It will always be useful to read content from other authors and use something from other websites. It's actually very difficult in this busy life to listen news on Television, therefore I simply use the web for that purpose, and obtain the latest information. I'm amazed, I have to admit. Rarely do I come across a blog that's both equally educative and engaging, and without a doubt, you have hit the nail on the head. The problem is something not enough people are speaking intelligently about. Now i'm very happy that I found this in my hunt for something regarding this.